In a city that is dominated by Cirque Du Soleil shows, another show with acrobats might seem played out, but nothing could be further from the truth. WOW at Rio Las Vegas is a variety show featuring acrobats that dazzle the eye, magicians that confound you, and performers that do everything from dance to juggle. If you are familiar with Cirque routines you might see some similarities and this could be considered a toned down version of those strip shows. For the price, you get 90 minutes of entertainment that rivals most shows on the Las Vegas strip. There are typically multiple show times each day and it is an all-ages performance. Tucked away in a cellar in the Masquerade Tower at Rio Las Vegas, the Wine Cellar and Tasting Room at Rio Las Vegas is a hidden gem that is often overlooked. The Wine Collection consists of both new world and old world varietals with a significant number of impressive collectible bottles. The major draw at this wine cellar is the over 100 bottles available by the glass. You order a glass of wine and settle into a plush lounge and imbibe among bottle that range from an 1800 Madeira to your favorite Pinot from the central coast. A menu that pairs well with by the glass suggestions is available. The knowledgeable wine stewards will walk you through your own palette and help you find your wine of choice. The Wine cellar is open daily at 4 p.m. This zipline adventure is different in that it is set up more like an amusement park ride where you ride on a cart that you are then strapped into. The zip line hovers 490 feet above the resort as you zip across from the Masquerade Tower to the Ipanema Tower. While top speed is only 33 miles per hour, the acceleration will take your breath away, and the added feature of riding the zip line in reverse is a treat. The total length of the attraction is just over 800 feet, and you will ride going forward and backward. Open to all ages before 7:30 p.m. with free admission to the VooDoo Rooftop Nightclub and Lounge included. From this vantage point on top of the nightclub, the strip is illuminated and frames every photo you take. The dance floor allows you to dance with the stars high above, and the quaint spots inside the lounge still allow for quiet conversation. Upstairs, the steakhouse is good for a meal to start the evening, and if you ride the VooDoo Zipline your cover fee is included. Open daily at 8 p.m. with cover charge starting at 10 p.m. These comedians who just so happen to be fabulous magicians still hold the top spot when it comes to Magic mixed in with comedy in Las Vegas. Penn And Teller have been performing in Las Vegas for over two decades and their show continues to look refined and fresh. Their timing is tight, and audience participation is always a bonus. This is an all-ages show. It’s no secret that television celebrity chef Guy Fieri has a big personality and it shows through in his food at El Burro Borracho Restaurant at Rio Las Vegas. The big flavors come in the form of the Trash Can Nachos that are loaded up with cheese, beans, protein, onions, and a huge dollop of cream. There is very little that can be considered authentic about this dish, but it is addicting nonetheless. Try the drunken fish tacos or the picadillo burrito and you get a glimpse at Fieri’s attempt to fuse Mexican cuisine with American tastes. No Mexican restaurant visit is complete without a margarita and your choices range from the spicy Caliente Margarita that is infused with jalapeño peppers to a Mezcal treat that is smokey and hoppy as they include ​an IPA as a float. The big hair era of rock and roll is alive and well at the Rio Las Vegas at KISS By Monster Mini Golf. The attraction is a combination game room, museum, and mini golf course, all with a nod to the Rock Band Kiss. Check out the memorabilia from world tours and costumes as you conquer the 18-hole mini golf course. The space is adorned with neon lights and a sensory overload of action that works very well to distract you while standing over a 10-foot putt for the win. All of your favorite Kiss songs are on the soundtrack, and naturally, because it is Las Vegas, cocktails are allowed on the course. The golf course is open daily from 10 a.m. to midnight and is an all-ages attraction. Each and every night, groups of women pack the Chippendales Theater to watch a dozen male performers as they serenade the women with lusty ballads and then rock the room with striptease numbers that take the cheering to a glass-breaking pitch. The theater comes alive with those that lose their inhibitions as the dancing becomes quite suggestive while still being a lot of fun. Be it bachelorette parties or birthday celebrations, the large groups that show up to this event are impressive. The show runs nightly and guests must be 18 years or older. 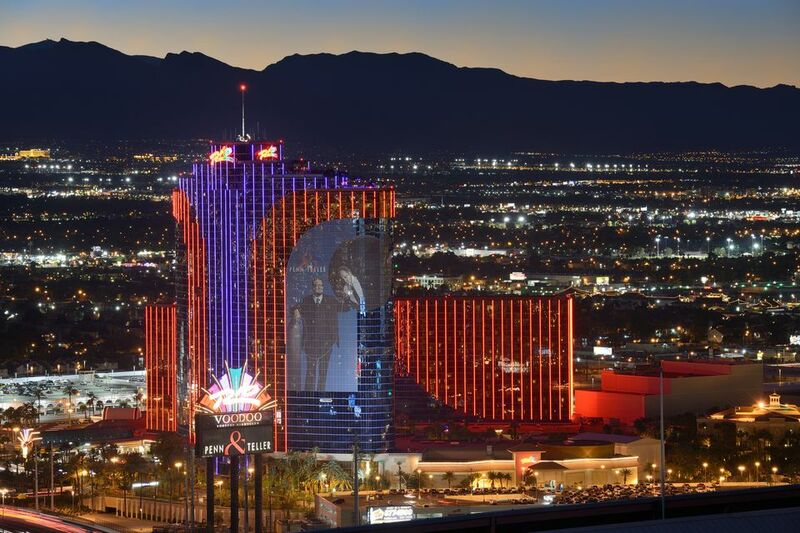 Every May, the World Series of Poker set up in Las Vegas at the Rio Resort for nonstop poker tournaments to crown the very best poker players in the world. The entire poker tournament culminates with the Main Event, a $10,000 buy-in tournament that ends with one person being handed the Main Event winners bracelet. With over 70 events and buy-ins ranging from $365 to 1 million dollars, this is the largest poker tournament in the world. Players from all over the world descend on the Rio Las Vegas in early summer, and the entire resort is buzzing with poker mania. Guests are allowed to walk through the gaming areas where professional poker players can be seen grinding out at cash games or working through multiple day-long events. If you are a poker player, this is a must-do event.